Last year was not a particularly good year for peace and security in Africa. In the Central African Republic (CAR), the Democratic Republic of Congo (DRC), Egypt, Libya, Mali and South Sudan, Africa experienced a resurgence of conflicts and violent instability in 2013. These and other crisis situations drew a wide range of responses from the African Union’s (AU’s) Peace and Security Council (PSC). One way of understanding these responses is to examine the statistics on the work of the PSC. According to the latest ISS report, the Annual Review of the African Union Peace and Security Council 2013/2014, the PSC conducted a total of 61 meetings in 2013. This is the highest number of meetings held by the PSC in a year since it became operational in 2004. These meetings resulted in the adoption of 70 communiqués and statements, with the former bearing binding decisions. In these meetings, the PSC took a wide range of decisions on a number of peace and security issues that affected the various parts of the continent. The Annual Review provides a picture of the activities, the outcomes and the individual cases that dominated the PSC agenda last year. It also gives insight into the increased number of personnel deployed in peace support operations. Over 70% of the agenda of the PSC was dominated by the situations in two regions, namely Central Africa and the East and Horn of Africa. The two regions accounted for 19 statements and/or communiqués each. Situations in West Africa, North Africa and Southern Africa resulted in the adoption of eight, five and four statements and/or communiqués respectively, and accounted for less than a third of the agenda of the PSC in 2013. In Central Africa, outcomes included the suspension of the CAR from AU activities for unconstitutional change of government; initiation of the establishment of the International Contact Group on the CAR (ICG-CAR); the launch of a military operation in the CAR; and contributing to the United Nations (UN) decision over the authorisation of an intervention brigade that helped end the M23 rebellion in the DRC. In the East and Horn of Africa, outcomes of PSC engagement ranged from a review of the African Union Mission in Somalia (AMISOM) and expansion of its force to the provision of support through the AU High Implementation Panel on Sudan (AUHIP), together with IGAD, to help Sudan and South Sudan resolve disputes over the implementation of the agreement that had been signed in September 2012. The outcome of the PSC’s engagement on North Africa concerned Egypt’s suspension from AU activities for unconstitutional change of government and the launch of the high-level panel on Egypt. In Southern Africa, the PSC had served as a catalyst for reactivating the International Contact Group on Madagascar (ICG-M), reinvigorating mediation efforts to break the stalemate on transition, and mobilising assistance for the holding of general elections. In West Africa, the result of the PSC’s engagement included the mobilisation of diplomatic efforts for restoring constitutional order in Mali and Guinea-Bissau, culminating in national elections in Mali and an agreement on a final schedule for elections in Guinea-Bissau, along with the deployment of a joint AU–Economic Community of West African States (ECOWAS) mission known as the African-led International Support Mission to Mali (AFISMA) to help Mali regain control over its northern territory and stabilise the region. Reflecting on the most marked deterioration of peace and security, the amount of space that situations in the Central African region received on the agenda of the PSC in 2012 more than tripled in 2013. The situations in West Africa demanded one third less attention than in 2012. In 2012, the PSC did not consider any situations in Southern Africa and North Africa. In 2013, at least one situation from each of these regions attracted the PSC’s attention. In 2013, the AU deployed new missions in Mali, the CAR and expanded its mission in Somalia. Unlike previous AU missions, the new missions had been deployed in collaboration with the respective regional mechanisms. Somalia became the AU’s largest operation, with a total force strength of just below 24 000 personnel – although the number the UN had authorised was about 22 000. A total of 21 855 personnel were mandated to be deployed in 2013, making this the largest number of personnel mandated for deployment by the PSC in a single year. This can be understood in a number of ways. Firstly, it reflects the increasing capacity or willingness of the AU and regional mechanisms to deploy peace-support operations. Secondly, it can also be seen as a manifestation of the dominance of military conflict-management tools in the PSC’s response to crises. Perhaps significantly, it also reflects a surge in conflict situations that demand deployment of peace support operations. The statistics show that the PSC has shown increasing willingness to engage in most conflict situations. However, despite the rise in the number of PSC meetings and its willingness to engage most of the crisis situations on the continent, the responses to Africa’s conflicts and crises in 2013 left much to be desired. Examples illustrating this include the situations in Mali and CAR. 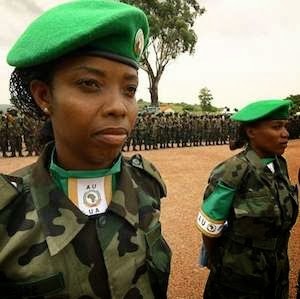 Despite the fact that the PSC dedicated the largest percentage of its agenda to the situation in the CAR, it did not undertake a rapid and effective deployment to arrest the rampage of Séléka rebels and the sectarian violence that ensued following the fall of Bangui. The PSC’s efforts were no doubt hamstrung by the tendency among some states and regional mechanisms to defy or refuse to accept the role of the PSC. The Economic Community of Central African States (ECCAS) countries, for example, refused to comply with the decisions of the PSC to isolate the Séléka leaders. The most notable success story in 2013 was the progress in Madagascar, which explains the improved peace and security outlook of the Southern African region (compared to what it was in 2012). This is largely due to the willingness that both the Southern African Development Community (SADC) and the AU showed for working together, and realising that each can play key role in unlocking the stalemate in Madagascar. Overall, a review of the PSC’s record in 2013 raises fundamental questions about the adequacy of the AU’s peace and security mechanisms, including the suitability of the African Standby Force to equip Africa with rapid deployment capability. Clear evidence of this was the AU’s failure to marshal effective responses on two occasions, with the result that French troops had to be deployed. Apart from concerns about the continent’s reliance on foreign military assistance, the increased use of troops to manage conflict in 2013 highlights the need to shift from ‘fire fighting’ to conflict prevention. Certainly, the PSC cannot be blamed for being absent in Africa’s major crises in 2013. One thing is clear, however. In many cases, the responses of the PSC proved to be too little, too late. This experience makes a solid case for reform of the African peace and security architecture if the opportunity that the PSC offers for realising Pax Africana is not to be lost.